Win a DVD of the Cardiff GP! This year's British Grand Prix has been described as the best meeting in the history of the series. There was incident aplenty, fantastic racing and an amazing twist on the final bend of the very last race. Thanks to our friends at GPNetMedia.com and BHP Sport we've got three copies of the official meeting DVD to give away. Here's the third of the three questions for you to answer. Question 3: What age was Chris Harris when he won the 2007 British Grand Prix? By now you should have one, two or three answers for our questions. Those of you with three will have the best chance of winning, but it's not impossible that three people will not get all the answers correct! Send your answers, along with your name and address to: dvd@speedwayplus.com by Wednesday 1st August. The three winners will be announced here next Thursday. Why Do They Ignore the Young? David Hensby makes a welcome return to the site and makes a plea to the stars of the shale. Why won't some of them stop and sign the autograph books of the kids on the terraces? As he recalls, a star like Peter Craven could leave a lasting impression on a youngster by such a simple act. Robert J. Rogers has uncovered an interesting event while conducting some research into the sport's early days. Was a meeting held at King's Oak the first ever team meeting? 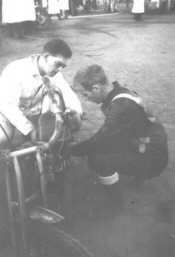 George Kearns is a Dublin historian conducting some research into racing activities at Shelbourne Park. He's looking for information on, and a photograph of, Ernie Roccio - Can You Help? There's a new official messageboard for Oxford Cheetahs speedway. Hopefully some of the debate will centre upon plans for a return to the senior leagues in 2008. Congratulations to former rider Jay Reed of No Brakes UK. His auction of a customised model bike for the Garry Stead fund raised an excellent £205. The second of three auctions kicks off on eBay on Sunday 29th July at 3pm - just type "Garry Stead" into the search box. "I loved Jeff Scott's comments on the Sky television presentation. Jeff, you are spot on with your analysis, I agree with everything you wrote, could be a new book here, look forward to seeing more of your comments." "It's great to remind myself of some of the times I had as a fan of Halifax Dukes stretching back into the 60's and such a shame that there is nothing going on so near to here these days. I wondered if there is anyone out there who has any access to video coverage of the 1983 World final at Norden in Germany which I and two friends attended. It was a superb day but being a relatively young lad let loose on all that nice German beer I don't remember much, although I know that the BBC covered highlights of it....including the bit at the end when my buddies and I joined Egon Muller on the winners podium!!! All dressed in our union Jack tee shirts [blush]." "I like your website - good information." "I was talking to an elderly gent at the Cardiff GP, he gave his name as Dai Evans I believe he's an old rider for Poole amongst others, also an ex promoter of Stoke I believe, anything of his riding past would great please as I throughly enjoyed chatting with Dai for nearly an hour on many speedway topics." Drop us an email if you've any memories of Dai. To be in with a chance of winning, you'll have to answer three questions that will appear on the site over a three week period. The first question was posed last week, if you missed it then you're sadly too late to get three out of three - but two out of three could be enough to win! Keep a note of your answers and we'll tell you where to send them when the competition closes. N.B. This question will be removed when the third question is added next Thursday. If you don't want to take your chances in our competition then you can order your copy direct from www.speedwaydvd.com for the bargain price of £4.99. They also have the box-set of last year's series available at a reduced price. If you've read the above extract then you'll already have a feel for the style of the book. Given the subject matter this book was always going to divide opinion - here's our tuppenth worth. Ben Hopwood of the Plymouth Devils has a new personal website. Jeff Scott is back on the road flogging his speedway books in the week ahead. You'll find him at Sheffield; King's Lynn; Stoke; Scunny; Reading and on the Island between now and next Tuesday. We featured his latest book - Shifting Shale - last week, scroll down for a book extract and review. 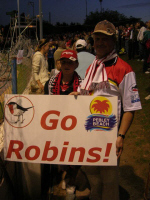 "I am a speedway fan and was a great supporter of the Bandits from 1987-1997. I loved the Lough and have many happy memories of this place. It breaks my heart to see these pictures but I have to remember the good times! One being Jimmy Nilsen breaking the track record at 55.1 seconds!" "This track was one of the best tracks that Berwick ever had. There was some good racing at Berrington. We all had good times there especially after the meeting. There was plenty car parking and the pits were good as was the bar." "It seems to be the old problem, Speedway just seems to be ignored whatever we do. Back in the glory days of West Ham, our Publicity Manager and then Team Manager, Dave Lanning was a press man and very good at publicity, did everything possible, but still got very little publicity. The local paper normally gave as much space to Speedway as it gave to the Schools football league and only made a bit of an effort in the summer when there was no real football news. It was famous for when it did give a mention, they got it wrong more often than right, still it gave you a laugh seeing what they got wrong each week. Their most famous was for not knowing the difference between a Russian & Swedish race jacket! In 2005, when the Local Authority had a 40th anniversary of it being created, it had to have the fact that there was a Speedway team pointed out to them. When asked why no mention of the sport in 1965, they said "'O' we did not realise that there had been Speedway then". We had only won the League, the K/O Cup and the London Cup, what else did we have to do to get noticed outside the walls of Custom House Stadium? Seems nothing has improved. " To be in with a chance of winning, you'll have to answer three questions that will appear on the site over the next three weeks. Keep a note of your answers and we'll tell you where to send them when the competition closes. N.B. This question will be removed when the second question is added next Thursday. Jeff Scott spent the 2005 and 2006 seasons travelling the length and breadth of the country researching, writing and selling his thoroughly unique speedway books. 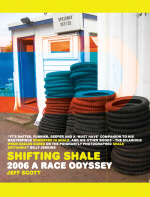 His latest offering "Shifting Shale" covers his 2006 adventures - a season that saw him become a well known face around the speedway tracks of the UK. In this review we let you know exactly what's on offer in his latest publication. Once you've read our opinion of the book, you can get a flavour of it by reading this extract. It covers the Reading v Swindon meeting in the play-offs last season, a meeting many of you will have seen on television or in the flesh. The auction of the model bikes for the Garry Stead fund is now underway - click here to view the appropriate ebay listing. John Hyam is trying to find photographs of some of the riders who appeared at California (Berks) speedway in 1954 - Can You Help? "I came across your site by accident really and enjoyed it. I spoke to other fans who had not heard of it either, suggest you contact speedway tracks for mention in their programmes." "Now this is what I call a Speedway website, great pictures of the old (and new) tracks. Has anybody got any photos of The Weir Stadium - Rayleigh? I was bought up just across the A127 Arterial Road, and went to many meetings in the 60's until it closed 73/74. I even rode a few laps under the watchful eyes of some Rockets team members of the time, including Terry Stone. Wonder if he remembers.....? I like the downloadable magazine too, great idea! Speaking of Roy Uden, I used to talk to him a lot about his speedway and stock car racing day's, in fact I first met him when he caught me playing in his old stock car behind his garage workshop beside the Rayleigh Weir Roundabout. I'm sure John Hyam can fill us all in on Roy's Speedway career." "Dudley Jones in his feedback compared speedway to football and came up with the conclusion that price is not the important factor in causing the declining numbers on the terraces. Football has always had a much wider appeal than speedway (being taught in schools, etc.) and as such, the number of supporters that have a high disposable income are less common amongst those that follow speedway. Even football is feeling the pinch however, and a recent survey indicated that about 1 in 8 people were not going to renew their season tickets because of cost. And the clubs most affected? The most expensive ones - the Premier League clubs. Speedway underwent hyper-inflation a few years ago. A lot of people used to visit more than one track a week, but gradually this has become less common. Others have been more selective in the meetings they have attended. While Dudley is right that better shows would mean the supporters would be less critical and selective in their attendance of meetings, even the greatest show on earth won't attract a sell-out crowd unless they can afford it. I wholeheartedly agree with Dudley that costs must be controlled as a priority and the entertainment factor must be increased. If speedway is not both affordable and entertaining, then its days are numbered irrespective of the league structure. " "Best web site in the world, I visit every day without fail. I'm an ex-rider and speedway will be in my blood forever. Boycey is me mate, he's still up there mixing it with the best, anyway gotta go, just wanted to thank whoever it is responsible for such a great web site." Sad news reached us this week of the death of Kiwi rider Bernie LaGrosse. 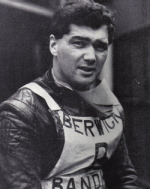 Bernie raced in the UK in the sixties for both Glasgow and Berwick - sometimes under the assumed name of Roy Williams. Tracy Holmes looks back over Bernie's career, one that spanned three continents. Philip Dalling looks at the coverage the sport receives in the national press and recalls a golden-age when things were very different. Philip's recent book on the history of Nottingham and Long Eaton speedway is available to purchase from our online shop. Steve includes our new national hero, Chris 'Bomber' Harris, in his Coventry Dream Team. For that reason alone it seems appropriate that we feature his selection this week. The first eBay auction for the model Garry Stead bikes kicks off this Sunday at 3pm. Jay Read of No-Brakes-UK has donated the very impressively customised models and all money raised will go to Garry's fund. Full details are on www.garrystead.com. You may remember this photograph from a few months back, it was from a selection of pictures taken by Gary McCormick at Southampton in 1961. 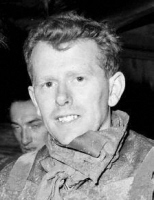 Opinion was divided between those who thought it showed Ken McKinlay and those that claimed it was Ove Fundin - the McKinlay camp being in the majority. Ken's son Adrian has been in touch from Australia and confirms that it's definitely Ken and that the man alongside him is his mechanic Pete Greet. Author Jeff Scott will be selling copies of his new books "Shifting Shale" and "Shale Britannia" at the following up-coming meetings. 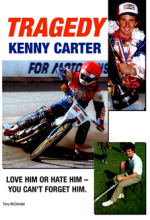 "Excellent article and good to hear that Kenny is back involved with the sport once again." "Unfortunately the recent tragedies involving Gary Stead in the UK and Kenny Olsson in Sweden (a rider I watched with pleasure at Glasgow in 2002) only reinforce the argument that speedway must be made as safe as it possibly can be. In which case it has to be compulsory that air fences are installed at every speedway track - it might make it financially difficult for the odd track, but if it makes the difference between a rider having a life after a crash (or not), how can you possibly equate cost with that kind of alternative? I didn't know that in some instances an air fence had been paid for by a track putting on a beginning of season challenge where the teams race for no payment, but if that's what it takes, or punters make up the cost in some other way, then surely it beats the price paid by Gary or Kenny in recent weeks, or so many other riders over the years?" "It seems to me that the Elite League is in serious trouble, with Oxford folding, Reading changing hands suddenly and talks about Peterborough seeing the season through. I am sure that speedway will survive, but perhaps it's time for a fundamental re-think? I cast my mind back to my first interest in the sport, in 1962, are there parallels with today? Then Ipswich folded (the week before I first saw Norwich Stars at the Firs). Then the National League was dying on its feet (with much larger crowds), yet we had a healthy youngster in the form of the 'lower level' (but possibly more exciting), Provincial League. Surely the sport needs to take a long look, at the terraces, at costs, at entertainment. I dont think its about admission costs, football is often much more per head. Let us have more local riders brought on, less commuting abroad, and much more showmanship. A radical idea - go 'provincial' again, to the roots. Only have foreigners if they ride only for British teams (same for home grown riders) maybe drop out of SGP and have regular race nights instead, to nurture the 'speedway habit'. Above all make speedway exciting (more basic bikes, closer racing, less costs) and a jolly good night out. Believe me, Ipswich with Louis, Davey, Lanham, etc., a politically incorrect (but very witty and lively) announcer, a great raceway and a sense of belonging and identification with the team, was magic and having to miss a Thursday night a tragedy. Perhaps time for a fundamental change, Premier League and an enlarged (and name changed) Conference League." "Sorry Greenlights but this is the very reason the Premier league is streets ahead. On paper Rye House looked as though they would cruise to the title but with bad injuries they have faltered in recent weeks. Many sides are doing surprisingly well with Somerset doing particularly well. Then over the last ten days things have really got hot with Rye staying close and winning the bonus at Kings Lynn then Stoke beating the Stars and finally Mildenhall getting within two points at the Norfolk Arena. No, one thing is sure, the second tier of British Speedway is teaching the Elite a thing or two. My money though is on Rye replacing Stuart Robson with a proven elite man before the season ends and winning the playoffs and the KO Cup double. Thats how I see it through my Blue and Yellow tinted specs, others may disagree but I firmly believe the season is far from over and long may the Premier remain the sport's number one league!"